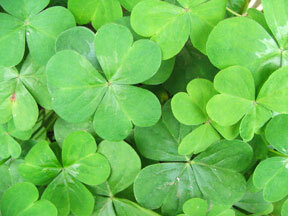 Lenore’s Pre-Passover Seder on St. Patty’s Day: Four leaf clovers instead of parsley? Passover orders are rolling in and I wonder (as I do every year) how I will manage to do all of the shopping and cooking for just two big days. I have already started to prepare some things for my own Passover Seder which for the first night will be an all-vegetarian one (Greek Matzah Meal-Spinach Pie, Layered Matzah & Cheese Mina, Syrian Pistachio Macaroons with Orange Blossom Water, Syrian Apricot Charoset, and Yemenite Date-Raisin-Pomegranate Charoset — all safe and sound in the freezer by now!). *Ask Lenore to provide sorbets, fresh fruit, maybe chocolate things? Preheat oven to 375°F. Pour oil in 7 x 11-inch or 8-inch square glass baking dish. Place casserole in oven and heat until oil is piping hot, about 5 minutes. Grater attachment (food processor): Grate potatoes, using light pressure. (The harder you press, the coarser the texture.) Transfer potatoes to a colander. To wash out the starch and keep potatoes white, rinse under cold running water. Squeeze dry and pat with paper towel. Steel Blade attachment: Process onion until minced, about 8 seconds. Scrape down sides of bowl. Add eggs, salt and pepper. Process for 3 to 4 seconds. Combine with grated potatoes and flour or potato starch in a large mixing bowl. Add about 3 tbsp. oil, leaving remaining oil in casserole. Mix well. Pour potato mixture into casserole. Sprinkle a little additional oil on top. Bake uncovered for about 1 hour, or until well browned and crispy. 6 to 8 servings. Keeps 2 to 3 days in the refrigerator. Reheats well. Freezing is not recommended. Thanks Norene. I am thinking about what a Sephardic kind of kugel would be. The Persians have various baked vegetable pies called “kuku-ye” that are similar to the frittata in that they use a lot of eggs mixed with a vegetable and bake it in the oven. One particularly simple and good one is made with cauliflower, eggs, salt, pepper, and a little bit of oil. Hi Jennifer. That sounds yummy. The Sephardi friends I put you in touch with for the Passover cookbook a few years ago make really nice vegetable pies. I love potato kugel but find other kugels too starchy. Frittatas are great though and nice and filling for Pesach. Did we chat about the book Stella’s Sephardic Table? I might make your apricot jam for Passover as they don’t have any good ones in the stores.